All hiking trails lead to the same destination: peace and quiet. It doesn’t matter whether you hike to get away with family and friends, or if you hike to get away from family and friends. 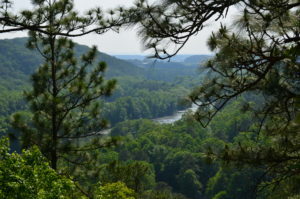 Nothing turns down the noise of life like a scenic walk along hills and rivers and lakes near Lake Allatoona. Plan your next adventure — or your next peaceful escape — by clicking on the links below. Choose from hikes that are judged to be Easy or Moderate. A path that is Moderate typically means the trail is in good condition, longer than an Easy hike and has “moderate elevation gain.” If you’re in good shape, you should be fine. Lakeside Trail is an ADA-accessible hiking trail for its entire length. That’s an enormous benefit to those who are unable to take more strenuous trails.